Celebrities are known to live a lavish and a flamboyant lifestyle. What a common, hardworking family man makes in an entire lifetime, celebrities make every month. No wonder they splurge on villas, designer brands, exotic travel locations and even engagement rings. Celebrities want the best of everything the world has to offer and that’s why when they give expensive gifts and become the talk of the town for years to come. Considered a beauty icon of Hollywood, she was a jewelry buff. Richard Burton gave her the jewelry in 1968 that has been most famously associated with her. It was a magnificent D-color 33.19 carat Asscher cut diamond, which was originally known as the Krupp diamond. She wore this ring for the rest of her life. Her engagement to billionaire James Packer became a talk of the town when he gifted her a 35-carat diamond and platinum ring. It’s worth is approximated at $6-8 million. Another ring that Mariah got was from her second engagement to Nick Cannon, a 10-carat pink diamond ring. Beyonce’s engagement ring was created by Lorraine Schwartz, which is the most popular choice on the red carpet. They created a gorgeous 18-carat flawless emerald cut diamond ring with a split shank. It is estimated to be valued at $5 million. From her first marriage to Kris Humphries, Kim got a 16.21 carat diamond engagement ring costing a whopping $2 million. Her current husband, Kayne West gifted her a 15-carat engagement ring, which is a D-Flawless Type 2A diamond and estimated to be worth $4 million. This would probably be the most expensive celebrity engagement ring of all times. 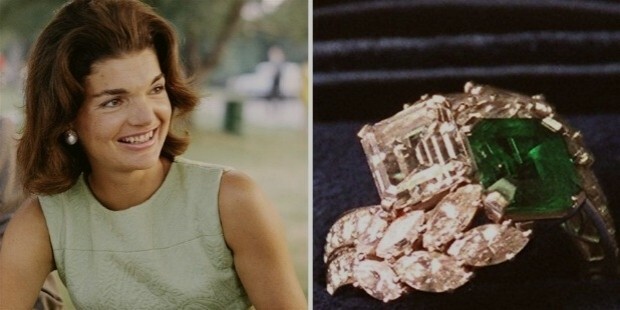 A whopping 40.42 carat flawless marquise-cut diamond was gifted to Jacqueline by billionaire Aristotle Onassis. He purchased this gem of a ring from Harry Winston. A large 24-carat emerald cut diamond engagement ring was gifted to Paris Hilton by Paris Latsis for approximately $4.7 million. This ring was later auctioned for $2 million to help the victims of Hurricane Katrina after the pair called off their engagement. The engagement ring gifted to the Duchess of Windsor represents the greatest royal love story of England. 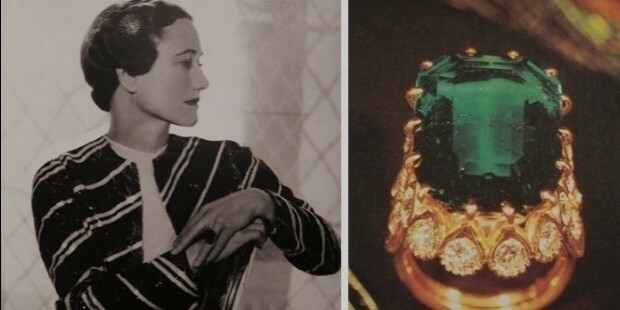 King Edward gave up his kingdom to marry her and gifted her a 19-carat an emerald ring on 1936. The ring was inscribed as “we are ours now”. Her engagement ring given to her by her ex-husband Mark Anthony was an 8.5 karat blue diamond. It is estimated to be valued at $1.2-$2.5 million. The First Lady flaunts a huge 12-carat emerald cut diamond ring from Graff and it is estimated to be valued at $2-3 million. Her Engagement ring gifted by Brad Pritt which took a year to design it.